My mom bought me a waffle iron for Christmas and this was the first chance I had to make waffles with it. I started with a simple recipe to make sure I got the hang of it and also the temperature setting right. I made a batch of the mix and made plain and chocolate chip waffles with it. I absolutely love being able to make my own waffles and Madeline enjoyed them and is already asking for waffles for next weekend. I’m thinking I’ll make yeasted pumpkin waffles next. I’m already thinking about how I can make vegetable waffles for Cooper when he’s eventually ready for finger foods. 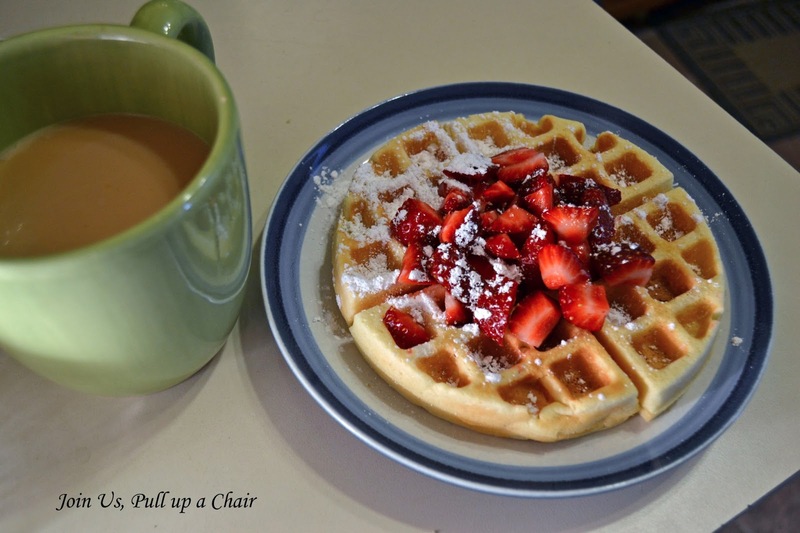 What are your favorite type of waffles? Mix together all the ingredients and store in an airtight container until you’re ready to use. Mix all ingredients together in a mixing bowl. Whisk until there are no lumps and the mixture is smooth. Preheat your waffle iron, ladle about 1/3 cup of the batter into the iron and cook for 3 to 4 minutes or until your waffles are golden brown. Top with your favorite toppings – fruit, syrup, yogurt…anything you desire!